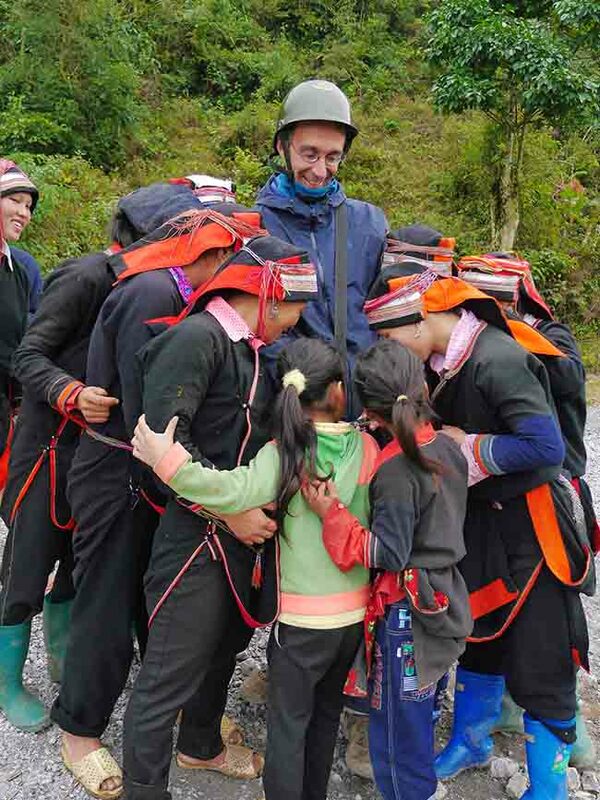 The motorbike tour of Hà Giang province is one of the best experiences I made in all my travels. Stunning landscapes, amazing roads, friendly and authentic people, local folklore and food. Definetely off the touristic trail and close to Chinese border. I can’t stop thanking Marie for proposing it to me and joining me in this adventure. It all started dropping off a night bus from Ha Noi to Hà Giang. It took few minutes to understand that nobody speaks English here, and this is the big city. Anyway we managed to rent a Honda motorbike for three days at 500 dong (20€) at Huy Hoàn hotel. So the adventure started. For the first time in my life I was driving a geared motorbike and for the first time carrying someone with me. Ahead nearly 400 km on mountain roads and a cloudy sky. It was December, probably not the ideal period for traveling the region. I confess that when after 3 hours we reached the peak and found ourselves in a dense mist and on a wet road I though it was hard to make it. But then the descent started and we dove in an other world. We were for sure remarkable being me so tall for Vietnamese standards and Marie blond haired. But still it was unbelievable how all the kids on the roads would be shouting to us “hello!”. Many adults also would and parents were often happy to show us their babies. Ladies carrying heavy loads on their back were smiling. When we were asking for taking pictures they were all so happy and excited to see them. It was so authentic. they really see no tourist here. 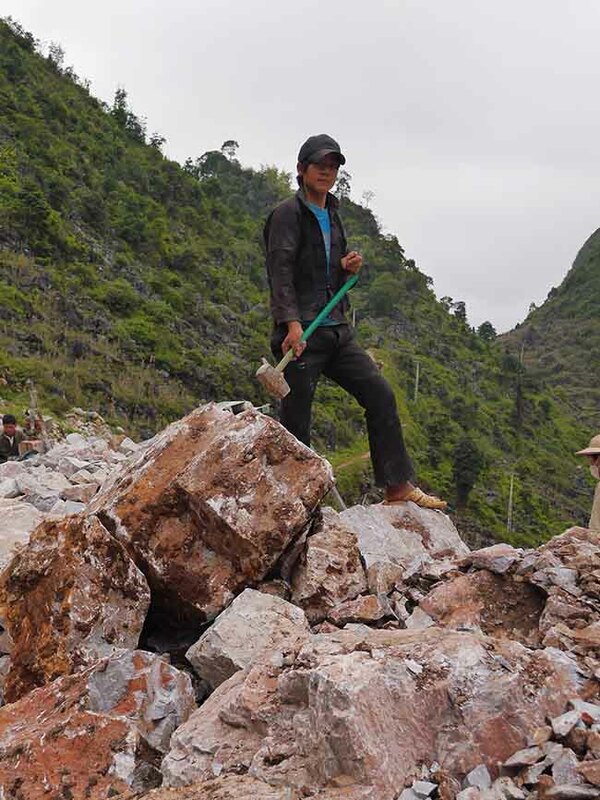 I didn’t expect this could still happen in a country such as Vietnam. We had the magic feeling of being pioneers. If I only could have some pictures of the jaw dropping faces some were doing when seeing us on those roads! 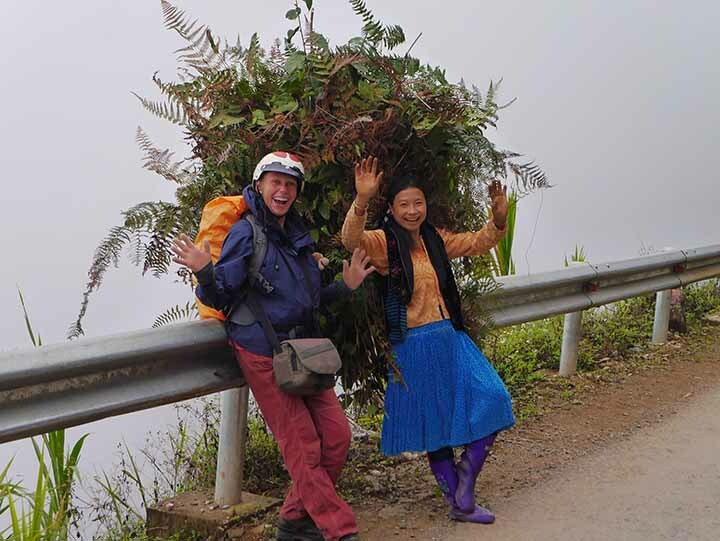 I didn’t go to Sapa because I was told you could see anything in that season. 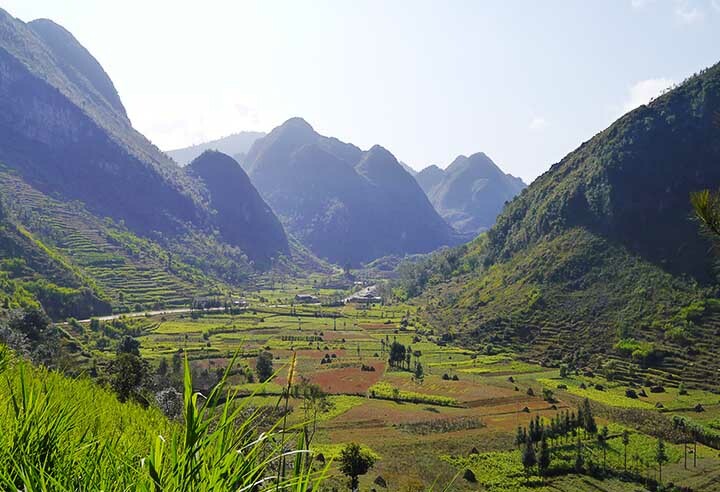 I know I made the right choice, having seen Hà Giang region on a full sunny day. Some hills have really strange shape, looking like they pop up from nowhere. Rice fields and tea cultivations looked great seen from above in certain points. The landscape was incredibly changing, both for conformation and vegetation, no wonder this place is called a paradise for geologists. We kept saying “it can’t be more beautiful than this”. But it actually it could all the time. 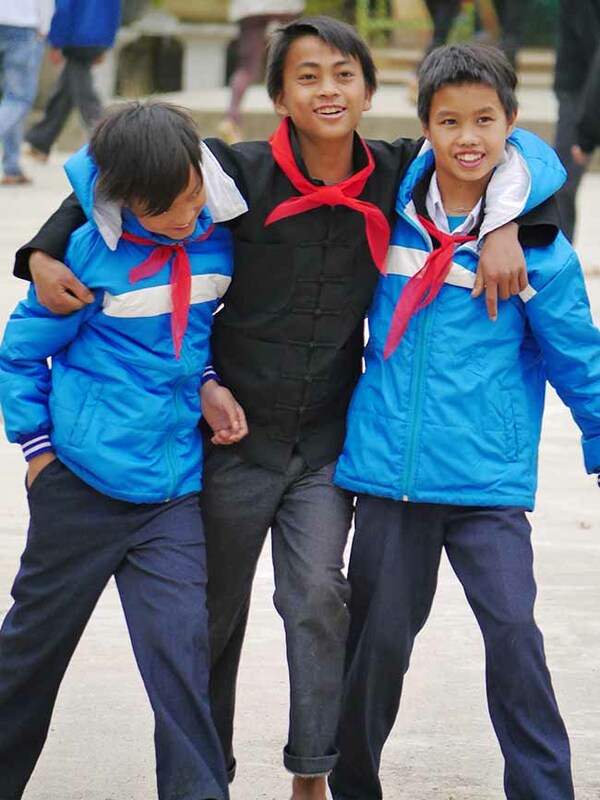 Being in Yên Minh on a Sunday morning was a big shot. Weekly market was on and people from the hilltribes around were gathering for trade and shopping. The most colourful ethnic experience ever! 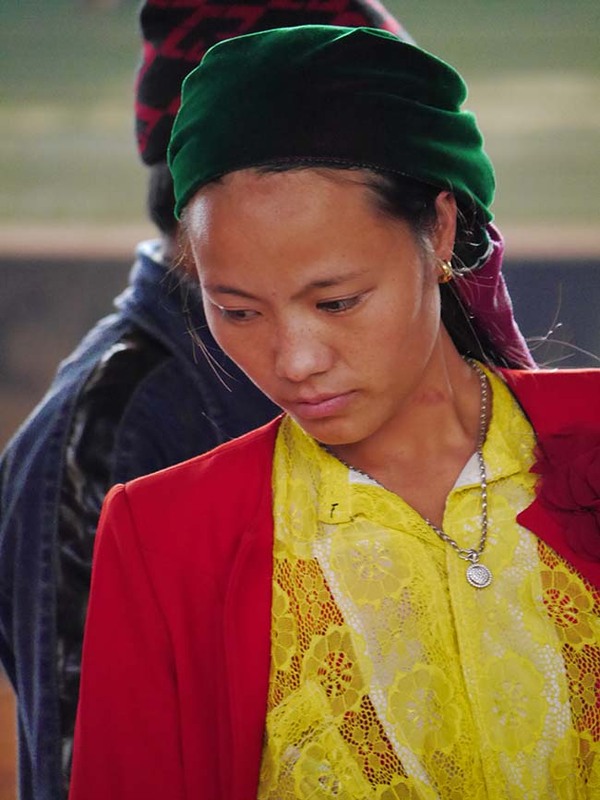 Ladies of each tribe have their own traditional costumes with colour codes and patterns. Seeing all that in a real life environment (not the tourist attraction you often find in South East Asia) was amazing. The butchery was particularly fascinating. About 20 tribes are said to live in the region. Seeing all those different groups in one place gave me a peaceful feeling of integration. I always look for discovering local food, often randomly. A couple of episodes highlighted this tour. 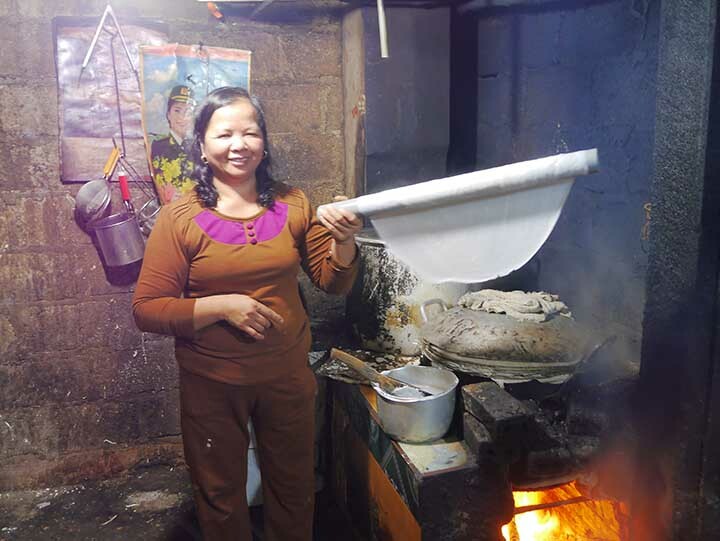 In Yên Minh we accidentally found a lady making phó (a very popular type of vermicelli noodles) for the next day. 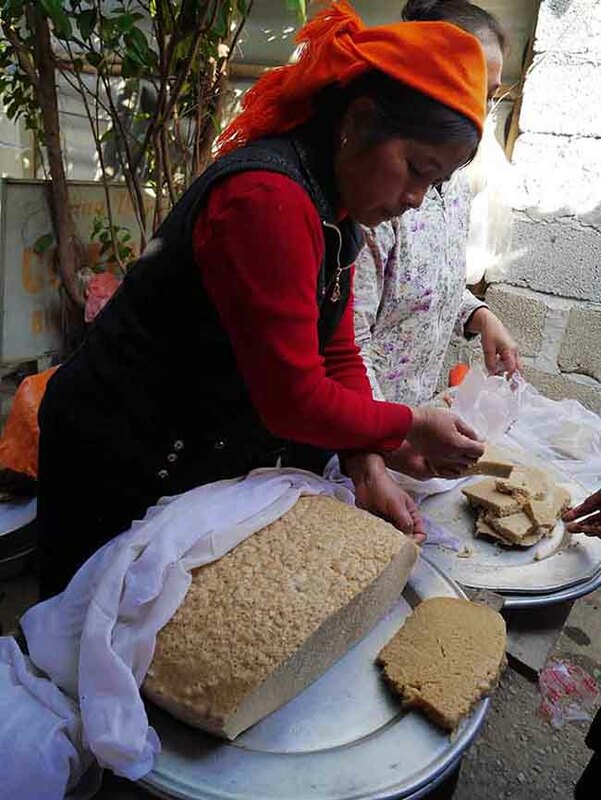 We were invited to see all the process (soaking rice, pressing it to get rice milk, cooking it as a pancake, hang them for drying and cut them), and of course we ate them made on the go. At Yên Minh market I couldn’t believe my eyes. 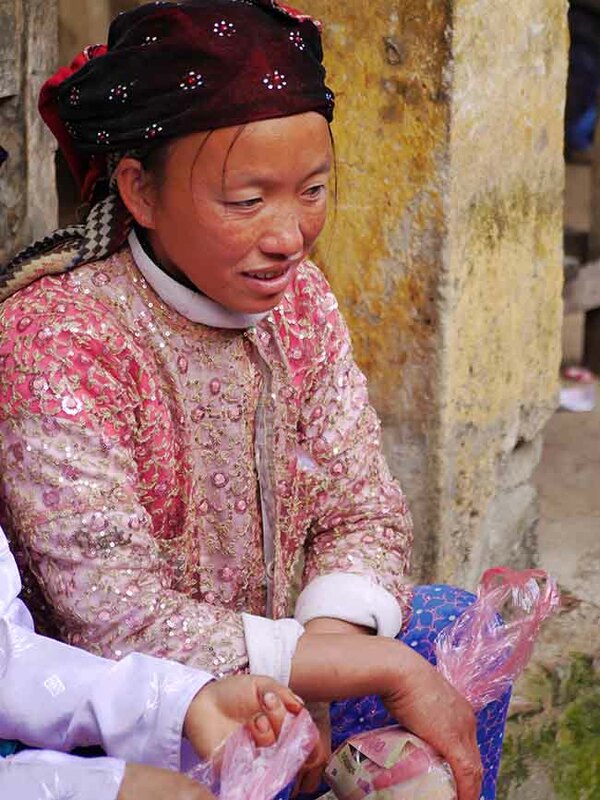 A hilltribe lady was cutting something looking like polenta exactly in the way my grandma does back in Italy. I had to try it. It turned to be sweet steamed bread (I imagine with rice flour and soy milk), really good. Ok, we didn’t have high expectations on the road conditions. But still what we found was very surprising. Usually you would expect better roads close to the city. Here it was the other way around. 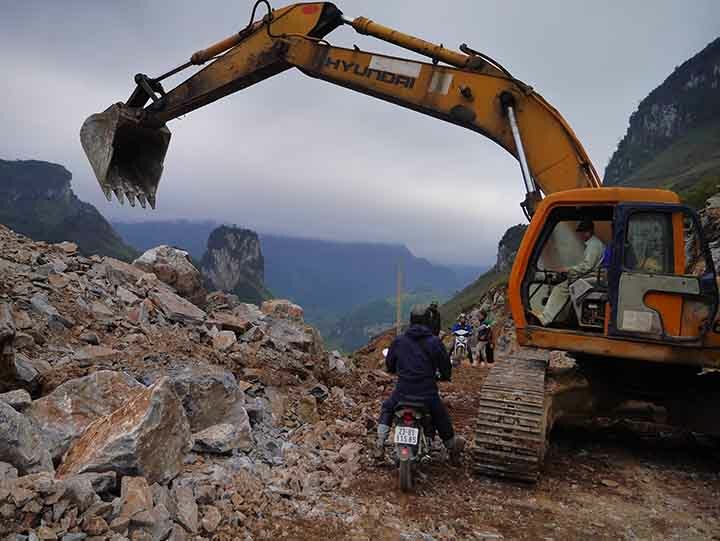 The last 20 km to Hà Giang where awful, while in some desert places on the mountains they were just great. What was really funny is that according to a printed map we got there and to Google maps and Maps.me apps often the supposed big road we were riding was… under construction. And the huge trucks passing all the time contributed to destroy the asphalt where present. I suppose that when the communist party decides “we make a new road” they just put it on the map; building it is a secondary issue LOL. But still we had so much fun on those roads! 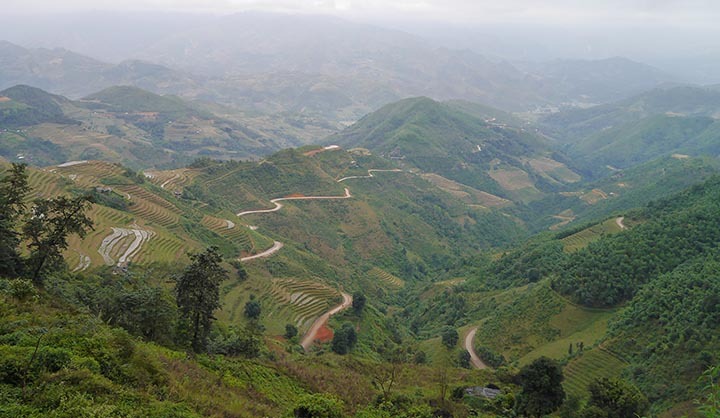 If you want an incredibly authentic and stunning experience in Vietnam go and ride a motorbike to Hà Giang Probably September-October has the best weather and fields colours. But whenever you come to Vietnam, just go. It won’t probably remain so unspoiled for many years. Don’t miss the chance. Formally you need a travel permit (20$) to travel the province close to Chinese border, in reality nobody cares, so we didn’t buy it. 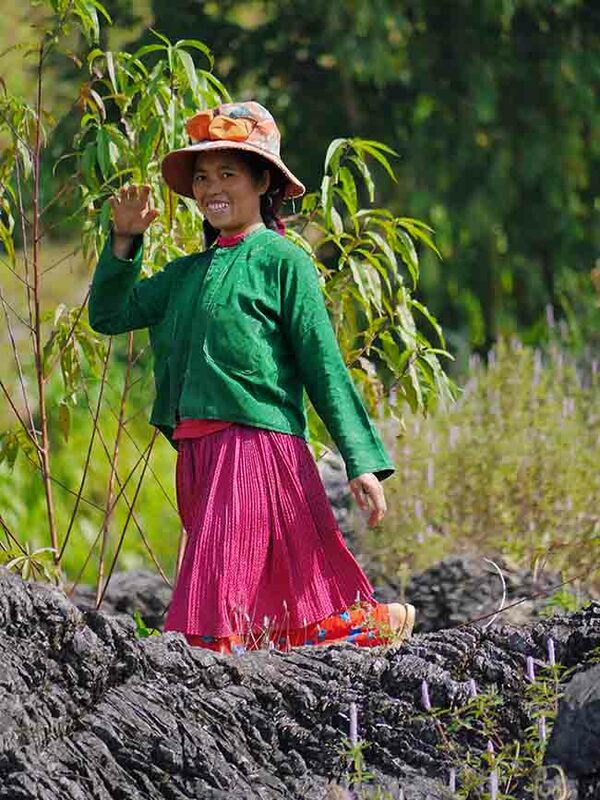 Posted in Travel and tagged food, Ha Giang, motorbike, people, street food, Vietnam. ← Be a tourist or a traveler?